This Franciscan complex was built between 1391 and 1396 using a donation made by the Caminate family, an ally of the Malatesta, on the site of a shrine erected to commemorate a miracle, but the first church was consecrated only in 1430. This early structure, rectangular and corresponding to the right-hand aisle of the present church, was embellished with a fine wooden ceiling of Venetian inspiration, a rarity in our region. The church was later enlarged and enhanced with important works of art. Between 1569 and 1578 a new church was built, incorporating the existing one. The wooden ceiling was also moved. The interior of the new church was frescoed in the 1600's, but some of the frescoes now to be seen externally beneath the portico, and rediscovered in 1919, date back to the 14th or 15th century. 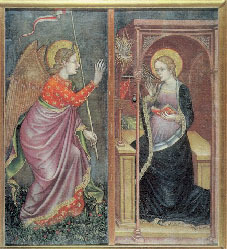 The frescoes show an Annunciation by the Umbro-Marche School. Above the main altar there is a painting showing the Annunciation to Mary of the Archangel Gabriel, attributed to the third decade of the 1400's, and painted by Ottaviano Nelli from Gubbio. Another important work is the Crucifix painted on wood, dated around the 1430's and attributed to the Emilia School, now in the second chapel on the left. The church also had several small 15th-century alabaster sculptures representing the Crucifixion, now in the museum of Frankfurt-am-Maine in Germany. It is easy to reach the sanctuary from the Highway exit Rimini North or Rimini South, or from the Adriatic road, turning in via Covignano and then following the many signs to Covignano. There are car park. From the city are available buses (bus n.15 and n.16) which depart from the train station. Going up from via Covignano, there is a Via Crucis, perhaps the oldest in the world, because it was spoken about already in1550; in the fourteen chapels built along the climbing path were hosted from 1750 large terracotta panels (155 x 120 cm) by Carlo Sarti from Bologna, which have been replaced, after the complete destruction of world war, by ceramics of the same size created by Elio Morri.